Contemporary and ultra-minimalist are at the top of the list when it comes to nailing this look in your bathroom. Steal ideas from boutique hotels, where darker colours are used to add a feeling of opulence. Look for bathroom furniture in sleek, dark wood, and go for feature walls of dark tiles - these will create those all-important sharp lines when contrasted with the crisp white of the bathroom fittings. Glossy finishes are a must - include glass, lacquer and polished tiles to add a sense of sleek luxury. Generous expanses of tiles will make the room feel clean and modern. Large format tiles give a high-end look - choose grout to match the tiles for a seamless effect. The latest bathroom gadgets can create a multi-functional bathroom that’s hard to beat. 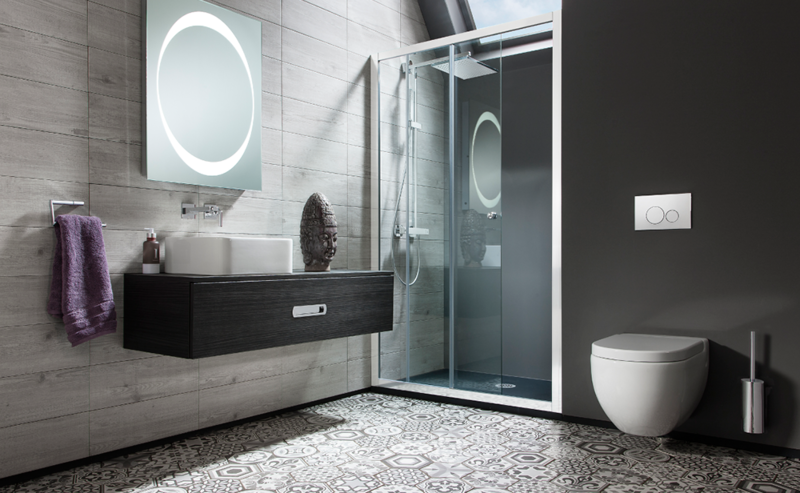 From improving the performance of your fittings - wellness products, demisting mirrors and digital water control (imagine controlling your water and shower temperature wirelessly with an App) - to the most up-to-the-minute audiovisual equipment, these elements are all designed to raise your bathroom experience to another level. Concealed waterproof speakers can stream music directly into your bathroom for a spa-style feel (connected to your WiFi for music from your computer, the internet or your phone), and an integrated waterproof TV means you can catch up with the morning news or relax in front of a movie. 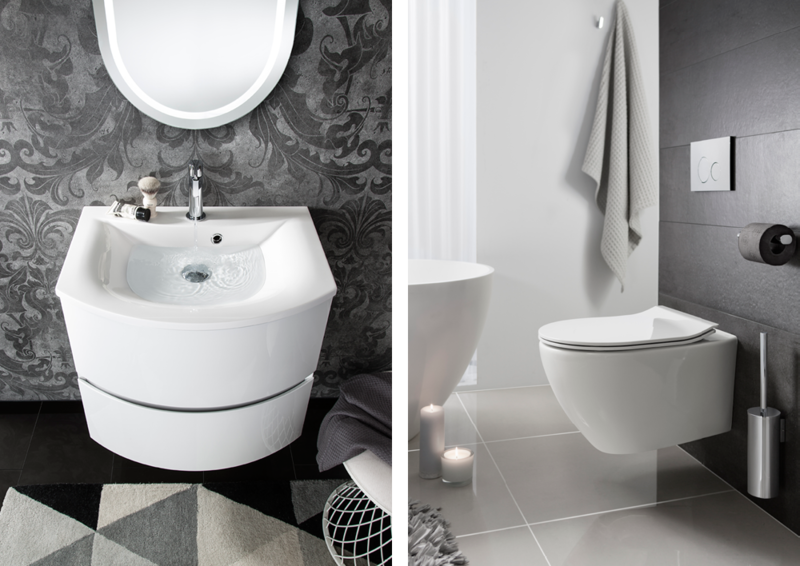 When it comes to the fittings you choose, the right selection is critical to making sure your bathroom ticks all the trend boxes. With ultra-minimal design in mind, a spacious walk-in shower enclosure is essential, with a frameless glass screen ensuring that the room’s clean lines remain uninterrupted. Make a chic, low-profile shower tray a must-have for a contemporary wetroom-style showering solution, and up the spa factor with a rain or waterfall shower. For a minimalist look that will also maximise the feeling of space in the room, keep fittings off the floor, opting for a wall-hung vanity unit and WC (complete with flush plate operation). 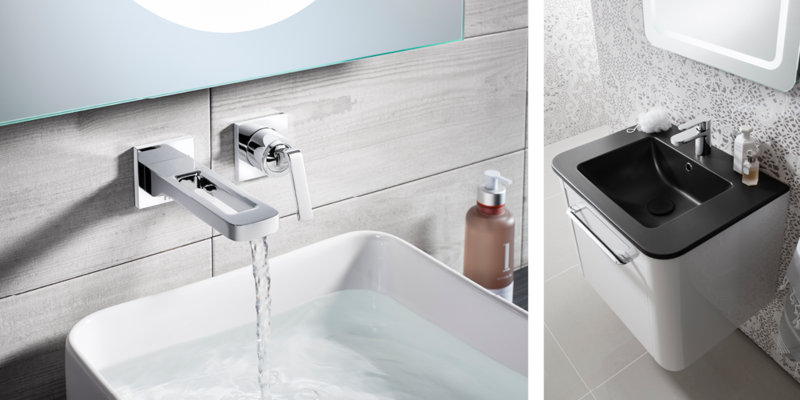 Double basins add that hotel vibe, or you could mount two single basins next to each other to achieve the same effect. As in the design of the deluxe bathrooms in boutique hotels, every detail counts, so carry your bathroom’s look right through to your accessories and toiletries. Go for high-quality towels and luxury toiletries to complement the razor-sharp styling throughout the space.